One thing that really sets OnePlaybook apart from other online playbook solutions or playbook software packages is the ability to easily and quickly use video. Since our recent HD video online playbook announcement, this is an even more coveted feature, so let’s break down how to upload video to your online playbook. This is what a team's online playbook's video section looks like, with the videos listed on the left. When a coach presses on Videos tab to go to the videos section of his online playbook, this is the page he sees. The videos he has uploaded are shown on the left, with information about the selected video on the right, and the button to bring him to the upload page on the bottom right. To upload a video, we’re going to press on that Upload button down at the bottom. 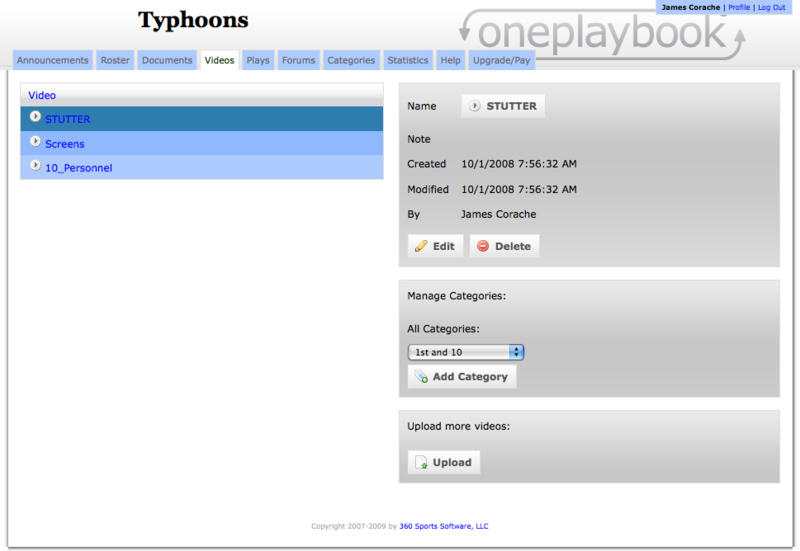 OnePlaybook's online playbook uploading area which is where a coach uploads videos as well as documents. This brings us to the upload page. When we press on the Browse button, a dialog pop-up appears that allows us to select multiple videos to upload. The video will then upload. Make sure that you stay on the same page and don’t navigate away because your video will be lost. The time the upload takes depends on the video file’s size, which can be determined by the length, quality and type of file. 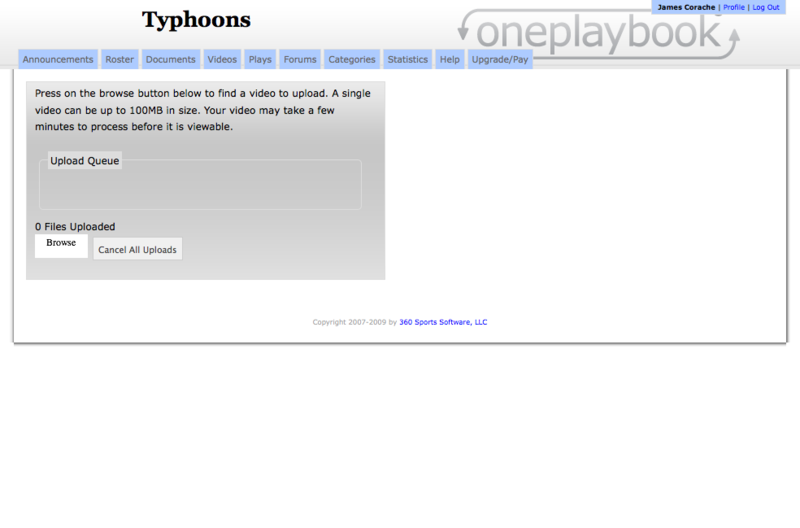 The beginning of a video uploading to your online playbook account. 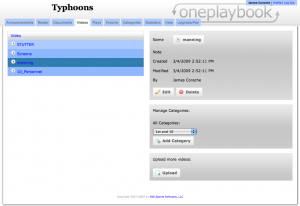 The types of files that OnePlaybook supports with its online playbook are avi, asf, flv, m4v, mov, mp4, m4a, 3gp, 3g2, mj2 and wmv. If you need help clarifying what any of these formats mean, just comment below. Once the videos are uploaded, they are converted to flv files to ensure that the most possible people will be able to view them as Flash is the most widely supported medium for video. The process of converting them will take a few minutes, so after you video has been uploaded, it will not be immediately available. 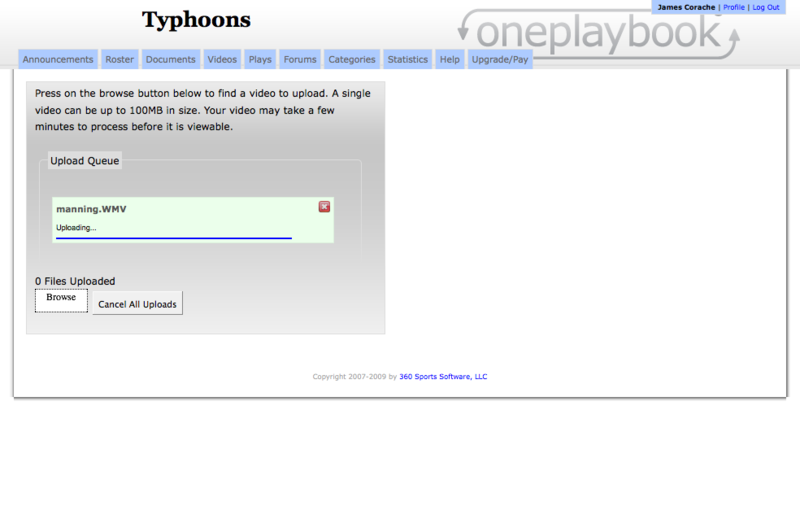 This is our video almost finished uploading, notice the progress bar moving from left to right. When the video is finished loading, the status will show Finished and then the box with the upload information will dissappear. This just means that it’s done uploading, not that it has been deleted. As the video is uploading, or at any time, you can cancel the upload or start to upload another video with no problem. It will simply add that video to the queue. Our new video is up and will be available for coaches and players to see. Now that our video has uploaded, it is available in the Video section of our online playbook for our team to see. We can press on the play arrow to the left of the name to play the video or press on the name to select it and then press on the video’s name on the right to play it. 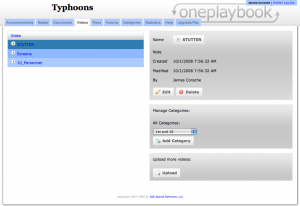 OnePlaybook allows a coach to easily integrate video into his or her online playbook whether you draw football plays online or use it for another sport and it is one of the most cutting-edge features of the package.